This article is about the 2002–2003 originated syndrome. For the 2012–2013 originated syndrome, see Middle East respiratory syndrome coronavirus. Severe acute respiratory syndrome (SARS) is a viral respiratory disease of zoonotic origin caused by the SARS coronavirus (SARS-CoV). Between November 2002 and July 2003, an outbreak of SARS in southern China caused an eventual 8,096 cases, resulting in 774 deaths reported in 37 countries, with the majority of cases in Hong Kong (9.6% fatality rate) according to the World Health Organization (WHO). No cases of SARS have been reported worldwide since 2004. Initial symptoms are flu-like and may include fever, myalgia, lethargy symptoms, cough, sore throat, and other nonspecific symptoms. The only symptom common to all patients appears to be a fever above 38 °C (100 °F). SARS may eventually lead to shortness of breath and/or pneumonia; either direct viral pneumonia or secondary bacterial pneumonia. As of 2015, there is no cure or protective vaccine for SARS that is safe for use in humans. The identification and development of novel vaccines and medicines to treat SARS is a priority for governments and public health agencies around the world. MassBiologics, a non-profit organization engaged in the discovery, development and manufacturing of biologic therapies, is cooperating with researchers at NIH and the CDC developed a monoclonal antibody therapy that demonstrated efficacy in animal models. Several consequent reports from China on some recovered SARS patients showed severe long-time sequelae exist. The most typical diseases include, among other things, pulmonary fibrosis, osteoporosis, and femoral necrosis, which have led to the complete loss of working ability or even self-care ability of these cases. As a result of quarantine procedures, some of the post-SARS patients have been documented suffering from posttraumatic stress disorder (PTSD) and major depressive disorder. SARS was a relatively rare disease, with 8,273 cases as of 2003. Probable cases of SARS by country, 1 November 2002 – 31 July 2003. The outbreak first appeared on 27 November 2002, when Canada's Global Public Health Intelligence Network (GPHIN), an electronic warning system that is part of the World Health Organization's Global Outbreak Alert and Response Network (GOARN), picked up reports of a "flu outbreak" in China through Internet media monitoring and analysis and sent them to the WHO. While GPHIN's capability had recently been upgraded to enable Arabic, Chinese, English, French, Russian, and Spanish translation, the system was limited to English or French in presenting this information. Thus, while the first reports of an unusual outbreak were in Chinese, an English report was not generated until 21 January 2003. 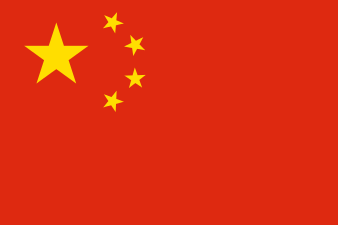 Subsequent to this, the WHO requested information from Chinese authorities on 5 and 11 December. Despite the successes of the network in previous outbreak of diseases, it didn't receive intelligence until the media reports from China several months after the outbreak of SARS. Along with the second alert, WHO released the name, definition, as well as an activation of a coordinated global outbreak response network that brought sensitive attention and containment procedures (Heymann, 2003). By the time the WHO took action, over 500 deaths and an additional 2,000 cases had already occurred worldwide. The epidemic reached the public spotlight in February 2003, when an American businessman traveling from China became afflicted with pneumonia-like symptoms while on a flight to Singapore. The plane stopped in Hanoi, Vietnam, where the victim died in The French Hospital of Hanoi. Several of the medical staff who treated him soon developed the same disease despite basic hospital procedures. Italian doctor Carlo Urbani identified the threat and communicated it to WHO and the Vietnamese government; he later succumbed to the disease. In Hong Kong, the first cohort of affected people were discharged from the hospital on 29 March 2003. The disease spread in Hong Kong from a mainland doctor who arrived in February and stayed on the ninth floor of the Metropole Hotel in Kowloon, infecting 16 of the hotel visitors. Those visitors traveled to Canada, Singapore, Taiwan, and Vietnam, spreading SARS to those locations. Another larger cluster of cases in Hong Kong centred on the Amoy Gardens housing estate. Its spread is suspected to have been facilitated by defects in its drainage system. Concerned citizens in Hong Kong worried that information was not reaching people quickly enough and created a website called sosick.org, which eventually forced the Hong Kong government to provide information related to SARS in a timely manner. The first case of SARS in Toronto, Canada was identified on February 23, 2003. Beginning with a woman returning from a trip to Hong Kong, the virus eventually infected 257 individuals in the province of Ontario. The trajectory of this outbreak is typically divided into two phases, with the second major wave of cases clustered around accidental exposure among patients, visitors, and staff within a major Toronto hospital. The WHO officially removed Toronto from its list of infected areas by the end of June, 2003. The Canadian State’s official response has been widely criticized in the years following the outbreak. Brian Schwartz, vice-chair of the Ontario's SARS Scientific Advisory Committee, described public health officials’ preparedness and emergency response at the time of the outbreak as “very, very basic and minimal at best”. Critics of the response often cite poorly outlined and enforced protocol for protecting healthcare workers and identifying infected patients as a major contributing factor to the continued spread of the virus. The atmosphere of fear and uncertainty surrounding the outbreak resulted in staffing issues in area hospitals when healthcare workers elected to resign rather than risk exposure to SARS. In late May 2003, studies were conducted using samples of wild animals sold as food in the local market in Guangdong, China. The results found that the SARS coronavirus could be isolated from masked palm civets (Paguma sp. ), even if the animals did not show clinical signs of the virus. The preliminary conclusion was the SARS virus crossed the xenographic barrier from palm civet to humans, and more than 10,000 masked palm civets were killed in Guangdong Province. The virus was also later found in raccoon dogs (Nyctereuteus sp. ), ferret badgers (Melogale spp. ), and domestic cats. 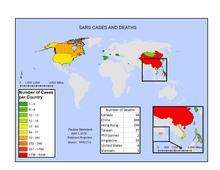 In 2005, two studies identified a number of SARS-like coronaviruses in Chinese bats. Phylogenetic analysis of these viruses indicated a high probability that SARS coronavirus originated in bats and spread to humans either directly or through animals held in Chinese markets. The bats did not show any visible signs of disease, but are the likely natural reservoirs of SARS-like coronaviruses. In late 2006, scientists from the Chinese Centre for Disease Control and Prevention of Hong Kong University and the Guangzhou Centre for Disease Control and Prevention established a genetic link between the SARS coronavirus appearing in civets and humans, bearing out claims that the disease had jumped across species. The World Health Organization declared severe acute respiratory syndrome contained on 9 July 2003. In the following years, four of SARS cases were reported in China between December 2003 and January 2004. There were also three separate laboratory accidents that resulted in infection. In one of these cases, an ill lab worker spread the virus to several other people. The precise coronavirus that caused SARS is believed to be gone, or at least contained to BSL-4 laboratories for research. Toronto’s Asian minority population faced increased discrimination over the course of the city’s outbreak. Local advocacy groups reported Asians being passed over by real-estate agents and taxi drivers and shunned on public transportation. In Boston and New York City, rumors and April Fools pranks gone awry resulted in an atmosphere of fear and substantial economic loss in the cities’ Chinatowns. ↑ Smith, R. D. (2006). "Responding to global infectious disease outbreaks, Lessons from SARS on the role of risk perception, communication and management". Social Science and Medicine. 63 (12): 3113–3123. doi:10.1016/j.socscimed.2006.08.004. PMID 16978751. 1 2 "Summary of probable SARS cases with onset of illness from 1 November 2002 to 31 July 2003". World Health Organization (WHO). Retrieved 2008-10-31. ↑ "SARS (severe acute respiratory syndrome)". NHS Choices. United Kingdom: National Health Service. 2014-10-03. Retrieved 2016-03-08. Since 2004, there haven't been any known cases of SARS reported anywhere in the world. ↑ "Laboratory Diagnosis of SARS". Emerging Infectious Disease Journal. Centers for Disease Control and Prevention. 10 (5). May 2004. Retrieved 2013-07-14. ↑ Lu P, Zhou B, Chen X, Yuan M, Gong X, Yang G, Liu J, Yuan B, Zheng G, Yang G, Wang H (July 2003). 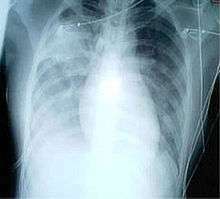 "Chest X-ray imaging of patients with SARS". Chinese Medical Journal. 116 (7): 972–5. PMID 12890364. ↑ "SARS: Prevention". MayoClinic.com. 2011-01-06. Retrieved 2013-07-14. ↑ Dandekar, A; Perlman, S (2005). "Immunopathogenesis of coronavirus infections: implications for SARS". Nat Rev Immunol. 5 (12): 917–927. doi:10.1038/nri1732. PMID 16322745. ↑ Shibo Jiang; Lu Lu; Lanying Du (2013). "Development of SARS vaccines and therapeutics is still needed". Future Virology. 8 (1): 1–2. doi:10.2217/fvl.12.126. ↑ Tripp RA, Haynes LM, Moore D, Anderson B, Tamin A, Harcourt BH, Jones LP, Yilla M, Babcock GJ, Greenough T, Ambrosino DM, Alvarez R, Callaway J, Cavitt S, Kamrud K, Alterson H, Smith J, Harcourt JL, Miao C, Razdan R, Comer JA, Rollin PE, Ksiazek TG, Sanchez A, Rota PA, Bellini WJ, Anderson LJ (September 2005). "Monoclonal antibodies to SARS-associated coronavirus (SARS-CoV): identification of neutralizing and antibodies reactive to S, N, M and E viral proteins". J Virol Methods. 128 (1–2): 21–8. doi:10.1016/j.jviromet.2005.03.021. PMID 15885812. ↑ Roberts A, Thomas WD, Guarner J, Lamirande EW, Babcock GJ, Greenough TC, Vogel L, Hayes N, Sullivan JL, Zaki S, Subbarao K, Ambrosino DM (1 March 2006). "Therapy with a severe acute respiratory syndrome-associated coronavirus-neutralizing human monoclonal antibody reduces disease severity and viral burden in golden Syrian hamsters". J Infect Dis. 193 (5): 685–92. doi:10.1086/500143. PMID 16453264. ↑ Hawryluck, Laura (2004). "SARS control and psychological effects of quarantine, Toronto, Canada." (PDF). Emerging Infectious Diseases. ↑ Ma Jinyu (2009-07-15). "(Silence of the Post-SARS Patients)" (in Chinese). Southern People Weekly. Retrieved 2013-08-03. 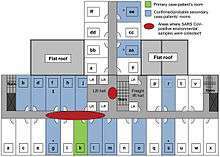 ↑ Oehler, Richard L. "Severe Acute Respiratory Syndrome (SARS)". Retrieved 2008-05-11. ↑ "Epidemic and Pandemic Alert and Response (EPR)". World Health Organization. ↑ "WHO targets SARS 'super spreaders'". CNN. 6 April 2003. Retrieved 5 July 2006. 1 2 Mawudeku, Abla; Blench, Michael (2005). "Global Public Health Intelligence Network" (PDF). Public Health Agency of Canada. 1 2 Rodier, G (10 February 2004). "Global Surveillance, National Surveillance, and SARS". Emerging Infectious Diseases. 10: 173–5. doi:10.3201/eid1002.031038. PMID 15040346. 1 2 Joseph Kahn (12 July 2007). "China bars U.S. trip for doctor who exposed SARS cover-up". The New York Times. Retrieved 2013-08-03. 1 2 "The 2004 Ramon Magsaysay Awardee for Public Service". Ramon Magsaysay Foundation. 31 August 2004. Retrieved 2013-05-03. ↑ "SARS death leads to China dispute". CNN. 10 April 2003. Retrieved 3 April 2007. ↑ "Sr. Irene Martineau". Oxford Medical School Gazette. Archived from the original on 10 October 2008. Retrieved 2008-11-10. ↑ "Hong Kong Residents Share SARS Information Online". NPR.org. Retrieved 2016-05-11. ↑ "Update: Severe Acute Respiratory Syndrome --- Toronto, Canada, 2003". www.cdc.gov. Retrieved 2016-05-11. ↑ "Is Canada ready for MERS? 3 lessons learned from SARS". www.cbc.ca. Retrieved 2016-05-11. ↑ "Remembering SARS: A Deadly Puzzle and the Efforts to Solve It". Centers for Disease Control and Prevention. 11 April 2013. Retrieved 3 August 2013. ↑ "Coronavirus never before seen in humans is the cause of SARS". United Nations World Health Organization. 16 April 2006. Retrieved 5 July 2006. ↑ Fouchier RA, Kuiken T, Schutten M, et al. (2003). "Aetiology: Koch's postulates fulfilled for SARS virus". Nature. 423 (6937): 240. doi:10.1038/423240a. PMID 12748632. ↑ Li W, Shi Z, Yu M, et al. (2005). "Bats are natural reservoirs of SARS-like coronaviruses". Science. 310 (5748): 676–9. doi:10.1126/science.1118391. PMID 16195424. ↑ Lau SK, Woo PC, Li KS, et al. (2005). "Severe acute respiratory syndrome coronavirus-like virus in Chinese horseshoe bats". Proc. Natl. Acad. Sci. U.S.A. 102 (39): 14040–5. doi:10.1073/pnas.0506735102. PMC 1236580 . PMID 16169905. ↑ "Scientists prove SARS-civet cat link". China Daily. 23 November 2006. ↑ "WHO | SARS outbreak contained worldwide". www.who.int. Retrieved 2015-10-16. ↑ Zhan, Mei (2005-01-01). "Civet Cats, Fried Grasshoppers, and David Beckham's Pajamas: Unruly Bodies after SARS". American Anthropologist. 107 (1): 31–42. doi:10.1525/aa.2005.107.1.031. JSTOR 3567670. ↑ Schram, Justin (2003-01-01). "How Popular Perceptions Of Risk From Sars Are Fermenting Discrimination". BMJ: British Medical Journal. 326 (7395): 939–939. doi:10.1136/bmj.326.7395.939. JSTOR 25454328. Alan DL Sihoe; Randolph HL Wong; Alex TH Lee; Lee Sung Lau; Natalie Y. Y. Leung; Kin Ip Law; Anthony P. C. Yim (June 2004). "Severe acute respiratory syndrome complicated by spontaneous pneumothorax". Chest. 125 (6): 2345–51. doi:10.1378/chest.125.6.2345. PMID 15189961. War Stories, Martin Enserink, Science 15 March 2013: 1264–1268. In 2003, the world successfully fought off a new disease that could have become a global catastrophe. A decade after the SARS outbreak, how much safer are we? SARS: Chronology of the Epidemic Martin Enserink, Science 15 March 2013: 1266–1271. In 2003, the world successfully fought off a new disease that could have become a global catastrophe. Here's what happened from the first case to the end of the epidemic. Understanding the Enemy, Dennis Normile, Science 15 March 2013: 1269–1273. Research sparked by the SARS outbreak increased the understanding of emerging diseases, though much remains to be learned. Life in Hong Kong during SARS – a gallery of images reflecting daily life in Hong Kong during the 2003 SARS outbreak.